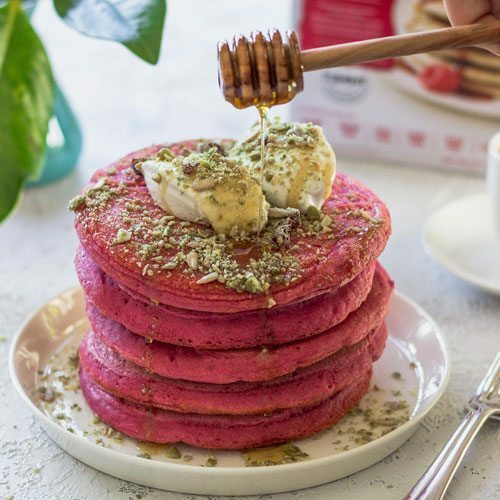 Spice things up a bit with these velvet red love pancakes. The perfect morning breakfast in bed. The beetroot is a great source of nutrients and antioxidants. 1. Peel and dice beetroot. Bring a pot of water to boil and add to pot. Simmer for 30 mins or until tender. Drain and allow to cool. 2. To a blender, add the beetroot along with the 220ml of water and puree. 3. In a deep mixing bowl, add the pancake mix, beetroot puree, milk and eggs. Whisk until well combined. 4. Using 1/3 cup scoop pancake mixture into lightly buttered, small non-stick frying pan. 5. Flip when bubbles appear. Cook each side for approximately 2 mins. Makes approximately 8 pancakes. 6. Serve pancakes with vanilla bean coconut yogurt, honey/or maple syrup, dried cranberries and crushed nuts and seeds.